ORGANISERS of the Nigerian Uncelebrated Awards UK have extended the deadline for the submission of nominations for another two weeks to July 17 in response to the late flurry of entries over the last few days. Due to take place on September 24 at the Mayfair Banqueting Suite in East London, the event will be a classy gala dinner that will attract community leaders, guests from Nigeria and High Commission officials. Organised to honour ordinary Nigerians in the UK who are excelling in numerous fields, the awards ceremony has been organised to honour ordinary Nigerians who have generally been overlooked in the past. On the day, 56 awards will be given out in recognition of how old Nigeria will become this year and originally, entries for nominations were due to close on July 3. However, over the last few days, there has been a flurry of activity, with dozens of entries coming in at the last minute, forcing the organisers to extend the deadline. Malcolm Benson, the chair of the publicity and marketing sub-committee added that there was also a lot of new entries from outside London, which made it important to extend the deadline so all the regions of the country could be served. He added that it is important that the other regions of England, Scotland, Wales and Northern Ireland were also recognised on the day. Former chairman of the Central Association of Nigerians in the UK, Chief Folayan, who is on the organising committee, said: “With the extension of the deadline, we should be able to get in a lot more people. I am hoping that the nominees will not only be from all parts of the UK but also include all groups like the young, women, the disabled, the elderly and all those others who have been overlooked in the past. Organising committee coordinator, Ayo Akinfe, added that among the distinguished guests who will attend on the day to hand out awards include the acting High Commissioner Simon Ogah, the chair of the House of Representatives Committee on the Diaspora Rita Orji and the special adviser to the president on diaspora affairs Abike Dabiri-Erewa. He pointed out that vice president Professor Yemi Osinbajo has also indicated he will attend if his diary permits. 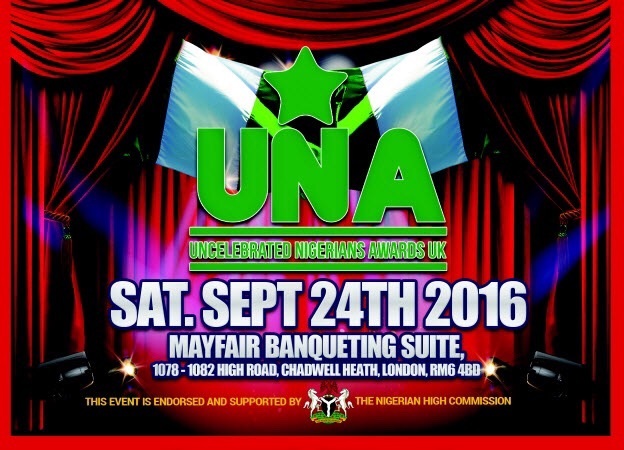 The Uncelebrated Nigerian Awards UK gala dinner will take place at Mayfair Banqueting Suite in Chadwell Heath in east London on September 24 2016, starting at 7pm. It will involve the handing out of awards to 56 Nigerian heroes who have excelled in numerous fields of endeavour. After the list is compiled, we will forward it to Buckingham Palace to be considered in the Queens Honours List. These awards were unique with regards to how credible and transparent they are.